AVI makes stereo as simple as Neutron 5 2.1 | What Hi-Fi? "They were designed as part of of a new system that gets rid of expensive separates boxes, costs a fraction of the price and performs at least as well as a conventional system costing three times the price." 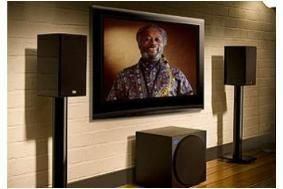 The subwoofer contains a 25cm drive unit, and what the company describes as "the latest Wolfson DAC with a special digital receiver chip that makes jitter negligible, thus rendering it independent of source. Some argue that this DAC is the best made." The six-input remote-control preamp has one analogue input and five digital ins: one electrical, three optical and one USB. The USB socket can also output any source to a computer for recording, and a digital display indicates the selected input, volume level and subwoofer set-up. The Neutron 5 2.1 system goes on sale in March, with the subwoofer in matt black and the Neutron 5 speakers in piano black lacquer.